Just how green is California? Deep green. 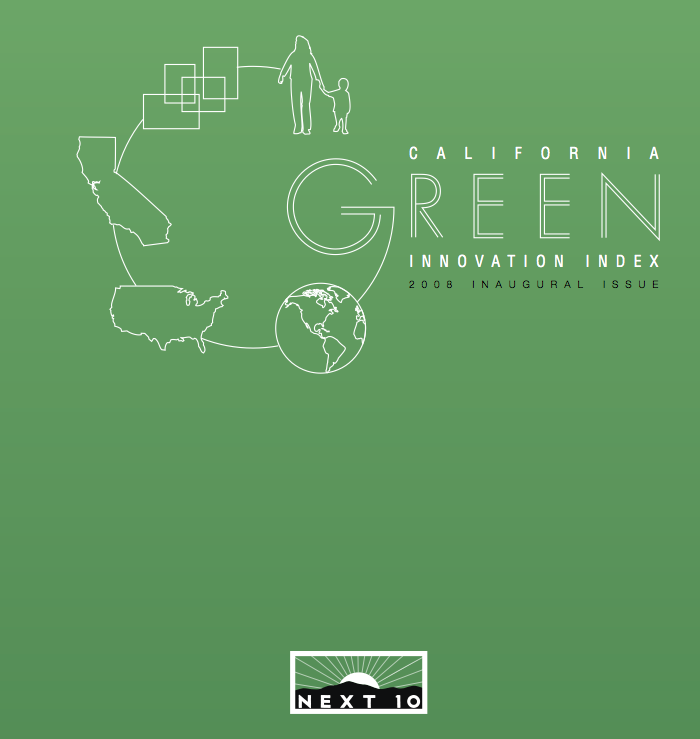 Very deep green, according to a new California Green Innovation Index compiled by Silicon Valley venture capitalist F. Noel Perry’s non-profit Next 10 foundation. That might be taken as so much environmental chest-thumping by Golden State partisans, but the report — the product of Next 10 and public-interest consultants Collaborative Economics — offers some persuasive statistics about the role green innovation has played in California’s fortunes. The conclusion echoes one repeatedly championed by green tech proponents, from Gov. Arnold Schwarzenegger to Silicon Valley venture capitalists: environmental innovation and economic prosperity go hand in hand. California holds 44% of United States patents in solar technologies and 37% in wind. The Golden State has 36 percent of the U.S.’s green tech venture capital investment. If we fast-forward to 2100, the emergence of solar energy will be viewed as one of the most transformative events of the 21st century. It will affect the environment, global economics and geopolitics. Solar can be deployed locally and there are no emissions. It will reduce air pollution, which will reduce the incidence of many public health problems such as the high incidence of asthma in urban settings. Since there are no noxious emissions, such as nitrous oxide and sulfur dioxide, associated with coal burning plants, the deployment of solar will alleviate the problems of acid rain and the denuding of forests due to acid rain. There is no carbon dioxide produced when semi-conductors such as silicon convert the sun’s energy into electricity. Therefore, the main cause of human induced global warming will be dramatically reduced from entering the atmosphere. Global politics will no longer be influenced by who has the largest petroleum reserves. This has led to strange bedfellows between Presidents and dictators, democracies and theocracies. Many states have adopted a Renewable Portfolio Standard (RPS) that mandates that investor owned utilities in the state produce a certain amount of their electricity by renewable means by a certain date. New Jersey’s RPS requires the IOU’s to produce 20% of their electricity by renewable means by 2022. It has also specified that 2% of this electricity come from solar. That translates into 1500MW of solar in New Jersey by 2022. Currently there are approximately 26MW installed. Each MW installed costs about $6,000,000. Approximately 60% of this cost is the solar panels. This is one small state. Imagine if the rest of the country adopts aggressive programs like this. No wonder, Sunpower is trading a 600 times trailing earnings! Recently, there have been several major announcements of 500+ Megawatt concentrating solar power plants being planned for the Mojave Desert. These plants will use parabolic trough mirrors to concentrate the sun’s energy on oil contained in tubes. The oil will be heated to several hundred degrees Fahrenheit and used to turn water into steam, thereby running a turbine, which will produce electricity. There has been a plant like this running in the Mojave since 1984, successfully producing clean energy. Over the last 20 years, the price of oil went dramatically down, the price of electricity was cheap and there was no public movement towards green energy. However, as oil has spiked over $90/barrel, the price of natural gas has gone up, the electricity markets have become deregulated and the price of retail electricity has skyrocketed, concentrating solar plants are starting to make economic, environmental and political sense. Using a fuel free energy source such as solar will prevent wild price swings in electric rates such as those seen in California post deregulation. Solar can be compared to a fixed rate mortgage while fossil fuel power plants can be compared to an adjustable rate mortage (ARM). The fixed rate mortgage is more expensive to begin with but you are protected from huge price swings that come with fluctuations in interest rates. An expensive lesson Wall Street and Main Street have both learned in recent history. As far as public policy goes, the United States needs to adopt a coherent, long term commitment to supporting renewable energy. Government incentives will be needed in the beginning, but as economies of scale are reached in production and installation, the government incentives can be phased out. Just as Eisenhower built the national highway system post World War II, the United States needs to update it’s national electric grid and invest in renewable energy infrastructure that plugs right into a 21st century “smart” grid. By preventing events such as the blackout of 2003 and the blackout in Queens, NY in the summer of 2005, these updates will pay for themselves with the avoidance of one major event. It is in our national security and economic interests to focus on the issue of future energy needs immediately. The 30% federal tax credit and accelerated depreciation for solar, commercial projects needs to be extended to at least 2015 in for the industry to continue to grow, bring costs down and become competitive with traditional sources of electricity. With these extensions, which are currently part of the Energy Bill which is in committee, the solar industry will be able to reach the holy grail of “grid-parity”, whereby solar will be just as cheap, if not cheaper to produce than traditional sources of electric production. Once “grid parity” is reached, all incentives can be removed and the beauty of the free market will take over pushing solar energy to installed capacity levels unachievable through government subsidized programs.